This wheel is a replica of the wheels that came stock on the C6 Corvette. 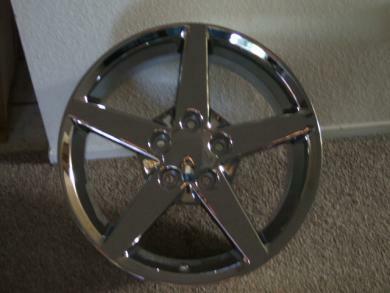 The wheel is Chrome, 18X9.5, 5X4.75 bolt pattern with a 54mm offset. The wheel is from a company called REV WHEEL. This wheel is NEW in the box. It has never been installed or used. I purchased this wheel with the intent to install an entire set on my 2001 Trans Am WS6. However I ended up trading the Trans Am in. If you have any questions call (916) 508-1290, ask for Mike.